Looking for online typing jobs. Well here is a list of Captcha typing sites where you can earn a sufficient amount of money from home or office whenever you are free. Yes. There is no time limit or target or Investment required for captcha typing works. All you need is PC with stable Internet connection with good typing speed. Well the Answer is “Sufficient Amount But Not Much”. Captcha works are not a big Make Money programs. If you can work for 3-4 Hours a day, Then all you can earn in a month is around 100$ to 120$. Its fair amount of money for those who are looking for Part time online data entry jobs from home. Own PC / Laptop with fast Internet Connection. Internet connection must be Stable. Don’t make lot of mistakes, repeated mistakes may result in permanent account ban. Megatypers is the top captcha job provider. They pay High amount for thousand solved captchas as compared to all other capthca sites. Megatypers pays 0.45$ to 1.50$ for thousand correctly solved captchas. The pay rates varies every hour. The minimum payment withdrawal is just 3$ & they pay weekly (Every Monday). Typers can easily withdraw their earnings in Megatypers. All they need to do is ‘Just reach the minimum payout threshold’ and they are done. All the earnings are automatically transferred to the selected payout account. 2Captcha.com is the best captcha site for the beginners, Because of the time limit that typers will get to solve each captcha. Beginners will get enough time to solve captcha. But the payrates for thousand correct captchas is quite low as compared to Megatypers. Typers can earn B/w 0.35 to 1$. Captcha loading speed in 2captcha is very good. If your typing speed is good, then you can solve 1000 captchas in an hour. 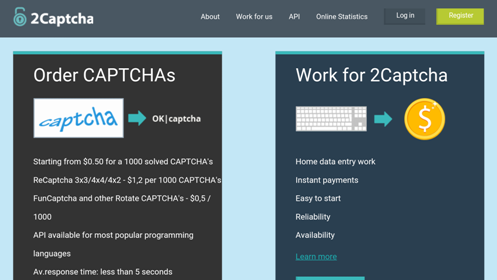 It is very easy to start with 2captcha, for those who are looking for online data entry works. Registration is very simple. just fill out the required information which is not going to take more than 5 minutes & you can start working immediately after successful signup. Payments will be made on request and the minimum withdrawal is 3$ for PayPal, 1$ for Payza & 0.50$ for Webmoney. They have two more payout options Bitcoin & Perfect Money. Very good feature of 2Captcha is Instant Payments. Kolotibablo.com is another genuine captcha entry site. Typers can earn upto 1$ for thousand correctly solved captchas. Beginners can earn in an avg of around 0.30$ to 0.50$. Best feature of Kolotibablo is fast captcha loading speed & stability. Typers can work for 24X7 without any issues. 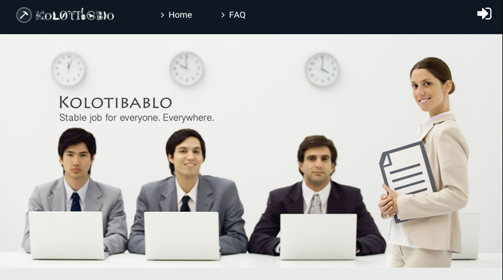 Kolotibablo provides various payout options such as, Payza, Web Money, BitCoins, Yandex.Money. Qlinkgroup.com is another genuine captcha entry job site. Qlinkgroup is absolutely free to Join. (Don’t pay anyone for Admin). Qlinkgroup has good captcha loading speed and stability. Typers can earn upto 1$ for thousand solved captchas. Payments will be made weekly (Every Friday). Payments can be withdrawn to PayPal OR Payza accounts. Protypers.com is the xerox copy of Megatypers. You can login to Protypers with Megatypers credentials Or you can do vise versa. Everything is same as Megatypers. Protypers and Megatypers are owned by same Authority. Protypers pays 0.45$ to 1.50$ for thousand correctly solved captchas. The pay rates varies every hour. The minimum payment withdrawal is just 3$ with Weekly Automatic Payout. Captchatypers.com is another genuine captcha work provider site. Typers can work on the site server or they can download latest captchatypers software. Typers can earn upto 1$ for thousand correctly solved captchas. The payrates may vary depending on hourly rates. Captchatypers is free. There is no need to pay anyone for registration. For new account registration you need to send E-mail to admin@captchatypers.com & you can request for login details. Once they approve your request they will send you login details with complete instructions. A primary Phone Or Mobile number including an alternative phone number if available. Captcha2cash is another good captcha work site. You need to download latest software to start working with captcha2cash. The payrates is 1$ for 1000 solved captcha & it is fixed at all the time. There is no hourly change in rates. All you need to have is fast & stable internet connection, because Captcha loading speed is average. If you don’t have fast connection, then you may not get enough captchas to solve in an hour. Typers can withdraw their earnings on request using Payza Or Perfect Money account. VirtualBee is one of the old site started in the year 2001. Typers can earn up-to 0.30$ to 0.50$ per thousand correctly solved captchas. Joining Virtual Bee network is not easy. First you need to signup at smartcrowd & you are required to complete typing evaluation tests & you must score high. Once you complete all the tests all you need to do is Just Wait, until you get Invitation from virtual bee. Virtualbee send invitation only if they want to hire you. Even though if you score high there is no guarantee that you will get immediate invitation from virtual-bee to join their network & start working. It is a long procedure. it may take months. But Virtual bee is a genuine site. so its worth waiting. Pixprofit is a good captcha work provider website. But currently registrations are closed. you can Check this link if New registrations are available. No matter how many new methods & opportunities on making money, most of the people search for the data entry works online. Because its a simple way to earn and suitable to all kinds of people from housewifes to students. just need a good typing skills are enough.. thanks for sharing ! Great article. People who make use of this opportunity can easily make money online. Good presentation! Thanks for your valuable comment Mahalakshmi. Glad you like the post. Keep visiting for more stuff.